STOP PRESS: Updated version out now! Classical singing training is no longer relevant for the theatre performer today. So how does an actor train his singing voice? 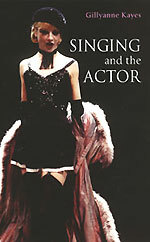 Singing and the Actor contains a structured training programme for the singing actor and dancer. Pitching, registers and breath management, the communication of sung text and the production of Belt, Twang and Speech qualities are all covered in this practical book. Revised throughout, this second edition now benefits from new insights on managing 'the break' and additional exercises for readers who process in different training modes. Dr Gillyanne Kayes is a highly respected vocal trainer with over 30 years experience working with actors, dancers and musical theatre singers. Numerous West End and international artistes have benefited from her accurate and practical information about the voice. Director of the Integrated Voice programme, Ms Kayes advises teachers of Musical Theatre throughout the UK, in Europe, USA, the Far East and Australasia. How do I make the notes? But I thought I wasn’t supposed to feel anything? When you add this book to your cart, check out our Professional Development Webinars page too. Gillyanne has created a special Singing and the Actor Q&A Webinar which brings you the updates that have happened since the second edition was written in 2004.